This program offers up to twenty NIMBioS Graduate Awards effective April 2019 and tenable through June 2020. The awards are designed to supplement the funding available for UTK/UTIA graduate students to enhance their research and education. The awards are each $2500, awarded through a competitive process managed by the NIMBioS Leadership Team. 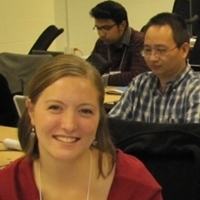 Beginning in 2008, NIMBioS invited current UTK/UTIA graduate students working at the interface between mathematics and biology to apply for graduate assistantships with the Institute. Applications were considered in the spring semester of each year for funding in the subsequent academic year, beginning August 1st. NIMBioS is currently not accepting new requests for support for Graduate Assistantships. Each summer, NIMBioS helps to present this 10-day program at the Mathematical Biosciences Institute (MBI) in Columbus, Ohio. Instructors are researchers in mathematics and the biological sciences from across North America. Graduate students from the mathematical, physical and life sciences are all encouraged to apply. The 2013 program and the 2017 program were held at NIMBioS. Mathematical sciences institutes in North America, including the NSF Mathematical Sciences Institutes, have formed a committee with the goal of joining together in their efforts to support the participation of underrepresented groups in the mathematical sciences, including women, underrepresented racial and ethnic minorities, and persons with disabilities. Different programs target undergraduates, graduate students, recent PhD's, faculty and professionals. The "Modern Math Workshop" at SACNAS (sacnas.org), with NIMBioS as the lead organizer in 2012, is one of these activities. The annual "Spring Opportunities" workshop is another activity of this group, with NIMBioS as the lead organizer in 2014. The event promotes opportunities for early career women in the mathematical sciences. NIMBioS hosts a number of tutorials related to the interface of biological/computational/mathematical research. NIMBioS has offered fellowships for visits of up to several months by graduate students interested in pursuing research with NIMBioS Affiliate Faculty, postdoctoral fellows or working group participants. Visiting graduate students worked on-site at NIMBioS. The program was designed to facilitate graduate student training while fostering research at the interface of mathematics and biology. The NIMBioS Visiting Graduate Student Fellowships program is currently not accepting new applications. NIMBioS has co-hosted panels on how to write a successful NSF Graduate Research Fellowship proposal. The NSF Graduate Research Fellowship Program (GRFP) recognizes and supports outstanding graduate students in NSF-supported science, technology, engineering, and mathematics disciplines who are pursuing research-based master's and doctoral degrees at accredited US institutions. The panels feature GRFP recipients and are moderated by faculty.